Gene Kindberg-Hanlon and David Young. The volume of world trade is now 17% below where it would be had it grown at pre-crisis trend after 2011. This post argues that most of this gap can be explained by weakness in world GDP, but stalling expansion in global value chains (GVCs) is playing an increasingly important role. We also argue that this shortfall can’t be explained by shifts in the geographical or the expenditure split of global GDP growth. While world trade grew twice as quickly as world GDP pre-crisis, it is likely to grow at about the same rate as world GDP in the future. This matters: weak trade could explain half of the 1pp fall in annual global productivity growth since the crisis. The trade shortfall is much larger than for world GDP, which is only 3% below trend (Chart 1). 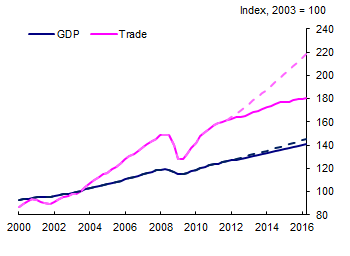 However, trade tends to be significantly more volatile than GDP. 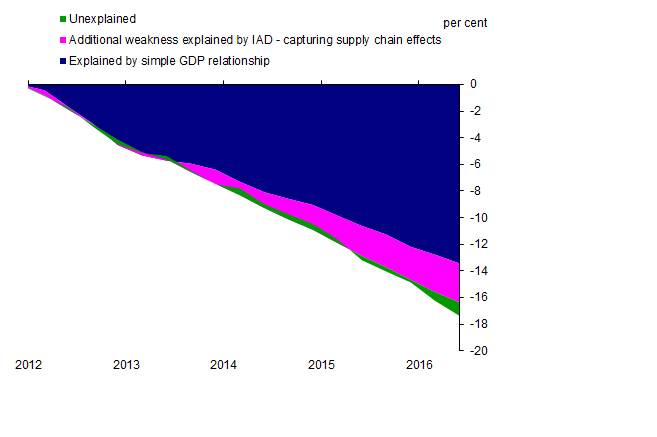 We estimate that 13pp of the 17% shortfall is explained by the weakness in global demand since 2012. This is based on an error-correction model (ECM) linking world imports and world GDP, estimated over the period 1995Q1-2016Q2. A more complex approach, similar to Bussière et al. (2013), can capture several additional effects on top of the shortfall captured by the simple world GDP relationship: the geographical and expenditure components of global demand, and the impact of changing import intensities and GVC developments. This approach weights countries’ GDP expenditure components by their import-intensities at each point in time, and then aggregates them to produce a global import-intensity-adjusted aggregate world demand (IAD) series. Due to data limitations we hold import-intensities fixed after 2011, proxying for anecdotal evidence that GVC development has stalled, but can still largely explain subsequent developments in world trade: an ECM linking world imports and world IAD can explain 16pp of the 17% shortfall, compared to the 13pp explained by a simple relationship with GDP (Chart 2). The additional explanatory power of IAD is not related to the changes in the geographical or expenditure composition of growth. When we hold either the geographical or expenditure component shares in our IAD measure fixed at pre-crisis levels, we find no additional weakness in trade relative to the IAD measure with updated values. Most of the difference between our IAD series and world GDP reflects changes in import-intensities, which grew rapidly in the pre-crisis period, but now appear to have stalled. This reflects GVC developments, whereby exports require increasing foreign content for production, and the relocation of production around the world increased the share of consumption/investment that was imported. A simple GDP and trade relationship estimated over a long period in which value chains were developing over-predicts the growth rate of trade once GVCs have stalled, whereas the IAD measure, which explicitly controls for changing import intensities, does not. In the remainder of this post, we outline why we think geographical and expenditure (weak investment) factors have played little role in the slowdown. We then speculate on what the current weakness of demand and slowdown expansion of GVCs could mean for trade in the future. 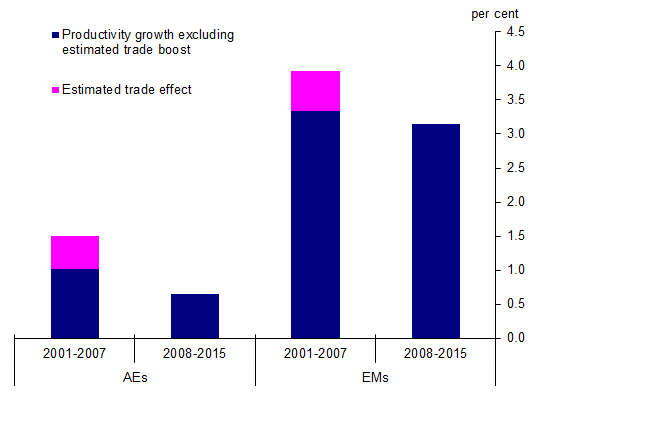 A year ago, Kate Stratford’s post on this blog argued that, while most of the slowdown in trade was consistent with the slowdown in global GDP, the increasing share of world GDP growth accounted for by emerging markets (EMs) could fully explain the trade slowdown. That was because their trade-growth-to-GDP-growth elasticity tends to be lower than that of advanced economies (AEs), while their share in world GDP has increased, particularly following the 2008 crisis. More recently the ECB has pointed to the geographical composition of growth as the most important driver of the slowdown, though structural factors are found to account for almost half the weakness. In other words, for a given growth rate in the import-intensity of GDP , we should expect to observe a smaller ratio of imports growth to GDP growth in faster-growing countries. As shown in Chart 3, from 1997 to the financial crisis the overall change in import-intensities was very similar in AEs and EMs. And during the financial crisis it was virtually identical. In contrast to the October 2016 IMF WEO, we find little role for lower growth in investment in explaining the weakness in trade growth since 2012, although we share the view that the majority of the slowdown is due to a general weakening in all demand components. Investment is often cited as a key driver of trade developments due to its high import-intensity. However, for the world as a whole, the contribution to world GDP growth is not particularly weak. 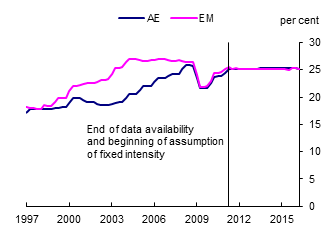 As outlined in a recent Bank Underground post, weak investment in advanced economies has been offset by stronger investment in emerging markets, such that the share of investment in world GDP has not fallen since 2012. 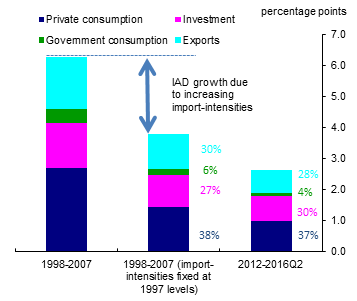 And investment’s recent contribution to IAD is broadly in line with its pre-crisis contribution (around 30% of total import demand growth), as can be seen by comparing the second and third bars in Chart 4. A recent post by the Federal Reserve also found that changes in the expenditure split of output do not appear to explain the weakness in world trade. One challenge to our conclusions is that the rapid rise in the import-intensity of demand in the run-up to the crisis boosted IAD growth by around 2.5pp per year, as can be seen by comparing the first and second bars in Chart 4. 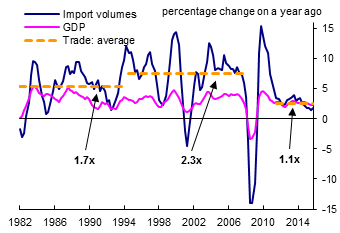 On the face of it, that would suggest that the stagnation of import intensities explains over half of the current weakness in trade demand relative to pre-crisis (first and last bars). And that would leave less of a role for weak demand to play. But this is largely because import-intensities and GVCs also vary over the business cycle as well as for structural reasons such as trade deals and technology, as argued in Kate Stratford’s post on this blog. This is why, as shown in Chart 1, a simple reduced-form equation using world GDP as a determinant of imports can explain the majority of the trade shortfall – this specification should implicitly capture the average demand-led variation in GVCs. In the data, supply chain development clearly stagnated following the collapse of the tech bubble and the 2008 financial crisis (Chart 3). Recent analysis by the OECD apportions only a small role to demand (40%) and a much larger role to declining supply chains (50%) than our approach – but their method does not assign variation in supply chains to demand, whereas our method does. Between 1982 and 1994, world trade grew about 1.7 as fast as GDP; from 1995 to 2007 it grew 2.3 times faster; but since 2012 it has only grown 1.1 times as fast (Chart 5). Average GDP growth hasn’t fluctuated nearly as much. As explained above, GVCs don’t appear to be a big factor behind the trade slowdown at the moment, explaining only one fifth of the slowdown (Chart 1), but they are likely to be in the future. A series of major trade agreements (NAFTA, EEA, completion of the Uruguay trade round and formation of the WTO) saw a large fall in tariffs and non-tariff barriers to trade. The ICT revolution allowed significant improvements to the abilities of companies to sell goods in foreign markets and coordinate production across multiple countries. Previously restricted markets in China and the Soviet Union opened up over this period. But these were one-time factors that boosted trade, and are unlikely to be repeated. Recently released world input-output data to 2014 suggest value chains did indeed stall post-2011, and it is likely that the effects of the pre-crisis surge in globalisation are now finished. Political developments suggest trade liberalisation will, if anything, go into reverse. Furthermore, it seems unlikely there will be a demand-driven recovery in trade. Global growth has repeatedly disappointed since the crisis, and even now is expected to remain subdued. The MPC’s global growth forecast only increases by 1/4pp over the next three years. And a recent post on Bank Underground also shows that the current rate of world GDP growth does not appear weak relative to many periods over the past 35 years, other than during the runup to the global financial crisis, suggesting there will not be much of pickup going forward. So while world trade grew twice as quickly as world GDP over the pre-crisis decade, it is likely to grow at about the same rate as world GDP in the future. Trade is thought to boost productivity through a range of channels, including increased specialisation and opening up domestic firms to foreign competition, improved capital allocation, and enhanced technology diffusion. Frankel and Rose (2000) estimate that a 1pp increase in the ratio of exports plus imports to GDP boosts the level of productivity by around 0.3%. The rise in this ratio was rapid pre-crisis, at around 1.5pp per year, but has since stalled. This would suggest that the weakness in world trade explains half of the 1pp fall in annual global productivity growth since the crisis (Chart 6). Gene Kindberg-Hanlon and David Young work in the Bank’s Global Spillovers and Interconnections Division. Next Post Mind over matter: is scarcity as much about psychology as it is economics? When you base Growth on Debt and unproductive investments, since 2008, and more Debt, eventually everything slows down, too much Debt and malinvestments. We now have a change in social mood,from positive to negative, around the Globe, some just entering negative mood and others, such as Europe more along. Add to the above Deflation taking hold. Slow Growth is here and will last several years, we have entered Winter based on K Wave analysis.